This is a saying that all people probably know. Our parents instilled this in our minds since we’re little. Neighbors are one of the many people we run to whenever we need help; be it financial, pieces of advice or simply a little tap on our shoulder to remind us that we are not alone. We feel more secure if we have neighbors around; but, is it always the case? When I was younger, there was this couple that used to be our neighbors. Their house is situated in their spacious lot that is full of fruit trees and other ornaments. Since they are quite strict on who they let in their yard, we felt somehow secure that no “other people” a.k.a. strangers would get a chance to come near our house through their yard. However, when this couple passed away, the security we felt back then started to fade. Their relatives refused to live in their house, so, it became an abandoned one and served as a haven for others. People of all ages (!) started hanging out around their yard as if it was theirs---children playing games, adults playing cards or sometimes, they even hold their drinking session there. The caretaker of the lot wasn’t really bothered by this but we, as the sole neighbor who feels that their privacy is being intruded, are. It started just last year when my brother noticed a human figure lurking in the shadows of our then-neighbor’s yard. That person was watching us through our windows! Creepy, right? My brothers and cousin tried to catch that person, and yeah, lucky they were able to. They were really about to inflict injuries (warfreak, ey?) to that person but when they realized that he’s a boy who lives in the same street, they decided to just let him go. Other people started coming out from their homes when they heard the commotion. Apparently, they too experienced the same with that boy. The story died a few weeks later. Few months later, when we thought that it won’t happen again, well, IT ACTUALLY HAPPENED AGAIN! I was in our terrace that night combing the fur of my late dear Yuki when I was startled to see eyes from the dark corners of the terrace. I couldn’t move for a few seconds because he really scared the h*ll out of me! He fled right away after I caught him looking. I am just not sure if it was the same person or his cousin. I felt really bad after that incident because I was only wearing my sleeping clothes when it happened. Who knows, that perv might have been stripping me naked in his mind. Grrr. I still feel angry whenever I remember it! After those incidents, we decided to put grills on our terrace for added security. We didn’t make the issues bigger than what they were already because: (1) we don’t have a tangible proof about the “suspect" and (2) we don’t want to create a bigger conflict. So yeah, we just let the issues go. BUT. Would you believe that some people-in-our-neighbor’s-yard issue happened for the third time around?! It wasn’t about peeping-tom anymore but something worse than that! My mom’s phone was stolen! In my twenty-something stay in our humble home, never did we experience stealing issues so it was kind of hard to believe at first. It was already 11pm when my mom asked me to get her cellphone which she left on top of the microwave oven. When I told her that it wasn’t there, she even got quite angry because she was so sure that she put her cellphone there. After searching the whole kitchen for the missing fone did we notice that one of the windows that we rarely open is, well, open. That was when it dawned on us that the fone was actually stolen. We have no one to blame for what happened but one thing’s for sure though; the one who got the phone is big enough and with arms long enough to reach our oven where the fone was. These incidents taught me to be very careful even when I’m inside the house. (Who knows, someone could be watching!) Whenever I go outside, I give people my “killer/angry eyes” look. 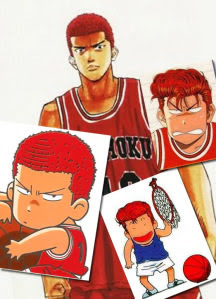 (Imagine Sakuragi, okay?) haha. They make me angry, really. We never know who to trust anymore. Good thing that they never meet my gaze; or I might slap them hard in the face! Kidding. :p Mabait po ako. haha. How about you? How’s the neighborhood? :) I hope they're nice. You know what, I live in a community with the same situation as yours. Though our family is not war-freak or something. I think you just got to live your own life, though of course taking to mind to love your neighbor even if they don't seem to love you back. Whoa you had a very weird neighborhood. Ours is quiet just full of sungit neighbors who don't even say hi even if you did say hello inside the elevator. 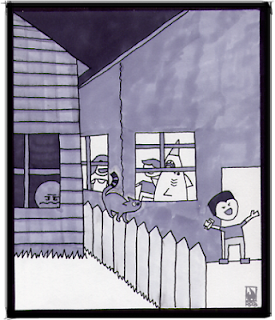 aww thats so awful, somehow some neighbors are nice and some are not. the peeping scares me more than stolen things, cause somehow if they got nothing to steal then they will give up but the peeping thing as long as there are people inside they have someone to peep in. I heard similar incident of people taking advantage of open windows. I lost several stuff too but mostly to pickpockets. Lol,I like your killer/angry eyes” look. My hubby don't trust people especially the neighborhood ,so when it comes to moving, the first thing he consider is the neighborhood. He is so protective of us and wanted us to be safe at home especially at night whenever he is not around. Right now, we have a good neighborhood.